What prompted Dr Jagdish Gandhi to act with such zeal and intensity is his firm conviction and commitment to world unity as he believes in oneness of God, oneness of religion and oneness of mankind. From his early childhood, he has been influenced, from time to time, by the life and thoughts of great personalities, more importantly the ones listed here. Inspired by Mahatma Gandhi, Dr Jagdish Gandhi besides imparting quality education, has been trying to inculcate universal values of Truth, Non-violence and Love for Whole Humanity in the minds of about 55,000 students of his school – the City Montessori School (CMS) Lucknow, India. Early in life young Jagdish was attracted to the teachings of Mahatma Gandhi and had always dreamt of seeing the great man in person. So he was devastated when he heard of Mahatma Gandhi's assassination on 30th January 1948 and realized that now he will never be able to fulfill this dream. Young Jagdish, then about 12 years old, was heartbroken, however he decided to carry on the Mahatma's mission of truth, non-violence and world peace for which he studied his autobiography and articles and carried out campaigns to eradicate social evils right from his days in school. Drawing inspiration from Victor Hugo who said “there is one thing stronger than all the armies of the world and that is AN IDEA whose time has come” and from the continuous struggle of Nelson Mandela for justice Dr Gandhi came up with the IDEA that “Enforceable International Law and Empowering the International Court of Justice is ‘THE IDEA’ whose time has come”. With this IDEA in mind, he called upon the World Judiciary on the need of Enforceable International Law to safeguard the future of world’s two billion children and generations yet-to-be-born. Since the last seven years he has been organizing annual international conferences of Chief Justices of the World as the self-appointed guardian of world’s two billion children. Baha'u'llah taught that ‘Earth is but one country and mankind its citizens’ and that world will not survive without unity of hearts. He said that remedy for all the ills of ‘This Day’ is ‘UNITY OF HEARTS’. 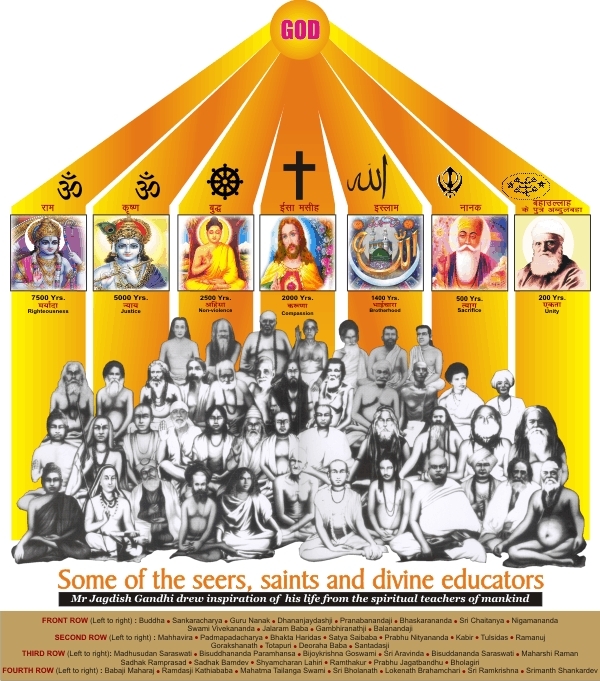 Inspired by His teachings, Dr Gandhi propagates His concept of Unity of Hearts, 'Oneness of God’, ‘Oneness of Religion’ and ‘Oneness of Mankind', through manifold daily school activities and also through 29 annual international events, to about 55,000 CMS students, their parents and global society at large. Baha'u'llah's great personality to fundamentally influenced and shaped Dr Gandhi's thinking later in 1974 is Baha'u'llah, Prophet and Founder of the Baha'i Faith, whose teachings permeate the daily life and thinking of Jagdish Gandhi. In December 1974, 33 years ago, young Jagdish Gandhi organized an International Youth Conference in London on the topic of 'World Peace through Education' from 17 to 19 December, 1974 at Victoria Hall, Ealing, London. where he met some youths from the Baha'i community. After learning about the Baha'i philosophy of the Oneness of God, Oneness of Religions and Oneness of Mankind and World Unity, so greatly was he impacted that he accepted the Baha'i Faith and declared himself a Baha'i. Subsequently, he gave up politics forever and rededicated his life to the meaningful education of children, having accepted Baha'u'llah's teaching that "Among the greatest of all the great services that can possibly be rendered by a man to Almighty God is the meaningful spiritual education of children, building their character and inculcating in their tender hearts the love of God." Inspired by Albert Einstein’s thought that “Only World Law can ensure progress towards a Civilized peaceful community”, he has been running a campaign calling all nations of the world to empower the International Court of Justice for peaceful resolution of international disputes which will also obviate the need for armed conflicts . Inspired by Nobel Laureate Jan Tinbergen’s observation that world’s problems can be solved only by strengthening the United Nations System, Dr Gandhi approached Kofi Annan, the then Secretary General, United Nations on behalf of two billion children of the world requesting him to safeguard the future of world’s two billion children by initiating steps to make International Law enforceable and binding upon all the nations of the world. Walking in the footsteps of Vinoba Bhave, he is making tireless efforts to instil his concept of Jai Jagat (victory to the world) in the hearts & minds of his students who greet each other with the call 'Jai Jagat' and have imbibed the spirit of global unity. He is raising his voice for the safe future of world's two billion children and generations yet to be born which has attracted worldwide attention. Bhave's influence the thinking of young Jagdish was Saint Vinoba Bhave, the spiritual successor of Mahatma Gandhi and progenitor of Jai Jagat (victory be to the world). Later in life, Dr Gandhi personally met Saint Vinoba Bhave several times and was so inspired by his clarion call that he chose 'Jai Jagat' (Victory be to the world) as the school motto of CMS. While greeting each other, every child says ‘Jai Jagat’. Another person who according to him has saved his spiritual life is his daughter Geeta Gandhi Kingdon. Dr Gandhi regards his second daughter as his ‘Spiritual Mother’ because she prevented him from contesting for a second term in state legislative assembly elections and be involved in divisive politics, since the family had now accepted the Baha’i Faith for spiritual regeneration and the faith prohibits its followers from participating in Divisive Politics which it believes is a hindrance in spiritual progress. “Though she is my daughter, I consider her as my spiritual mother”, Dr Gandhi proudly says. Born in 1963, Geeta had her early education in CMS. Having finished his five-year term as a Member of the Legislative Assembly (MLA) in UP State Legislature in early 1974, Dr Gandhi encountered and accepted the Baha'i Faith in London in 1974. In 1977 his uncle Prabhu Dayal persuaded him to contest the next bye-election to the State Assembly. But young Geeta, all of only 14 years old then, confronted her father and reminded him that the teachings of the Baha'i Faith prohibit believers from participating in divisive politics and that therefore he should quit politics for ever. She asked him to answer two questions: (1) What will happen to my faith in Baha'u'llah which you have given to me? and (2) What will happen to my faith in you as my father? Dr Gandhi had no answer. Though he was fully confident of winning the 2nd term of election, Geeta's words changed the course of his life and since then, during the last three decades, he never again participated in any political activity or elections. Dr Gandhi says that inspite of Geeta's brilliant academic achievements, acclaimed research works and writings, Geeta is still the same simple, humane, God-fearing and humble person, and a friend, philosopher and guide to him. “I keep learning from her life and achievements and above all her love for humanity and humility,” he says often. Geeta is a Professor at London University. The influence of the above people led Dr Gandhi to embark on a career dedicated to striving for world unity and world peace through education besides his commitment to quality education to children. Over the last five decades, his boundless energy, single-minded dedication and far-sighted vision led to unique contributions to the cause of World Unity through education. Raja Mahendra Pratap was a revolutionary freedom fighter and a great crusader for World Federation, who planted in the young mind of Dr Gandhi a strong dedication to bring about world unity because without ‘world unity’ there can be no lasting world peace. While he was a student of class XI at Mathura, young Jagdish met RAJAJI in his Prem Mahavidyalaya in Mathura where Rajaji gave him a copy of his Weekly Paper ‘Sansar Sangh’ (World Federation). The articles in Sansar Sangh shaped Dr Gandhi's commitment to spirituality and world unity. The fourth person who influenced Dr Jagdish Gandhi was his uncle Prabhu Dayal, a meagrely educated but highly spiritual man who was also a well-known village social worker. A dedicated-follower of Mahatma Gandhi, Prabhu Dayal suffered prison terms several times during the Indian freedom struggle with Mahatma Gandhi. He taught young Jagdish the basics of Gandhian thought and philosophy and exhorted him to always strive for the betterment of global society. The teachings of his uncle Prabhu Dayal lit the fire of spiritual awareness and World Unity in Jagdish since his childhood and motivated him to work for the spiritual regeneration of humanity. His uncle also taught Jagdish to treat the entire humanity as one family, following the Indian tradition of 'Vasudhaiv Kutumbukam' (the world is but one family).